Samsung (News - Alert) Electronics Co., Ltd., the world leader in advanced memory technology, today announced that it has developed a 3rd-generation 10-nanometer-class (1z-nm) eight-gigabit (Gb) Double Data Rate 4 (DDR4) DRAM for the first time in the industry. In just 16 months since it began mass producing the 2nd-generation 10nm-class (1y-nm) 8Gb DDR4, development of 1z-nm 8Gb DDR4 without the use of Extreme Ultra-Violet (EUV) processing has pushed the limits of DRAM scaling even further. 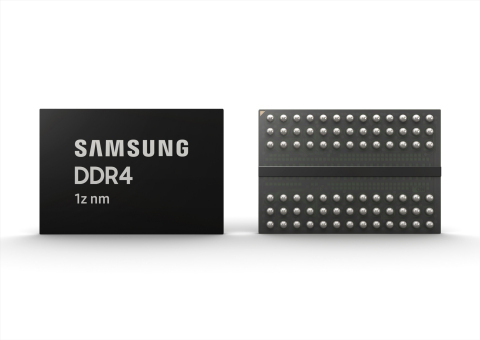 As 1z-nm becomes the industry's smallest memory process node, Samsung is now primed to respond to increasing market demands with its new DDR4 DRAM that has more than 20-percent higher manufacturing productivity compared to the previous 1y-nm version. Mass production of the 1z-nm 8Gb DDR will begin within the second half of this year to accommodate next-generation enterprise servers and high-end PCs expected to be launched in 2020. "Our commitment to break through the biggest challenges in technology has always driven us toward greater innovation. We are pleased to have laid the groundwork again for stable production of next-generation DRAM that ensures the highest performance and energy efficiency," said Jung-bae Lee, executive vice president of DRAM product & technology, Samsung Electronics. "As we build out our 1z-nm DRAM lineup, Samsung is aiming to support its global customers in their deployment of cutting-edge systems and enabling proliferation of the premium memory market." Samsung's development of the 1z-nm DRAM paves the way for an accelerated global IT transition to next-generation DRAM interfaces such as DDR5, LPDDR5 and GDDR6 that will power a wave of future digital innovation. Subsequent 1z-nm products with higher capacities and performance will allow Samsung to strengthen its business competitiveness and solidify its leadership in the premium DRAM market for applications that include servers, graphics and mobile devices.